Repco Home Finance Limited Career Job Notification 2017-2018 Opening Required for Any Graduate, Experience, Job in Chennai- Apply Online. RHFL Application Link, RHFL Salary, RHFL Last Date etc. Scroll Down. 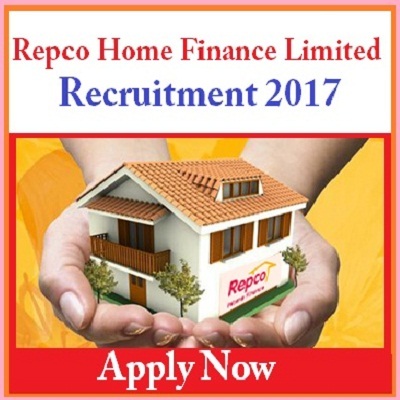 Repco Home Finance Ltd Recruitment Any graduate - Apply Online. RHFL is a professionally managed housing finance company headquartered in Across India, Across India. We were incorporated in April 2000 as a wholly owned subsidiary of the Repatriates Co-operative Finance and Development Bank Limited (Repco Bank Limited, repcobank.com ), a Government of India enterprise, to tap the growth potential in the housing finance market. We are registered as a housing finance company with the NHB. As on January 2014, RHFL is operating through 82 branches and 26 satellite centres in Across India, Andhra Pradesh, Kerala, Across India, Maharashtra, Gujarat,Odisha,West Bengal and Puducherry. General Computer skills and knowledge of lending policies under Retail credit, especially home loans. Scrutiny of loan sanctions under different loan products of RHFL to ensure policy compliance. Validation of assessment of Borrower's Income – Both salaried and selfemployed cases. Analysis of Balance Sheet and other financial statements. Assessment of value of properties with the help of Guideline Value and Market Value and verification of reports given by Panel valuers in assessment of value of properties. Thorough knowledge on online sanctions under the loan origination system (in house module) and Core Banking Environment. Perform a Comprehensive review and analysis of Credit sanctions on daily basis to identify any Credit weakness, policy or regulatory violations, servicing deficiencies etc., including analysis of financial statements on daily basis and submission of report on the deficiencies identified. Age not exceeding 62 years as on 01-10-2017. Retired bankers (Scale - IV & above as per IBA scale) with experience in credit appraisal / Sanctioning / Credit Review in Housing Loan. Rs.25,000/- per month + Meal coupon + Performance Incentive + Ex-gratia + out of station travel expenses, if applicable, as per policy. Eligible candidates are requested to apply only as per the enclosed bio-data format along with a detailed CV with experience details. Applications sent in any other format will not be considered. Applications in a sealed envelope super-scribing the “Application for the post of OSD/CHE/OCT 2017/CREDIT REVIEW OFFICER” shall be forwarded to the address as given below by post to reach the addressee on or before 31-10-2017 (5 PM). Address: The General Manager (HR), Repco Home Finance Limited, Corporate Office, 3rd Floor, Alexander Square, New No. 2, Sardar Patel Road, Guindy, Chennai – 600 032.